I love fruity cocktails especially if they have some type of berry ingredient. I love blueberries and they are one of my favorites. This cocktail recipe comes to us as a courtesy from Sparkling ICE. If you have never used Sparkling ICE before...I highly recommend them! They make making delicious cocktails super easy and you can find a lot of cocktail recipes by visiting their site online. Pour vodka and lemon juice over ice and stir. Top with Pomegranate Blueberry Sparkling ICE. Stir gently to combine the ingredients. 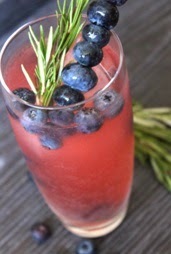 Garnish with fresh or frozen blueberries and a spring of rosemary. Disclaimer: You must be 21 years of age or older to consume alcohol. Please drink responsibly. Recipe and photograph are courtesy of Sparkling ICE. See their web site for additional information and for recipes.